The 1-st edition of Sofia International Model United Nations is over. Many of the participants have MUN depression and want to come back to Sofia for more SOFIMUN! Next year boys and girls we will be glad to see you again! 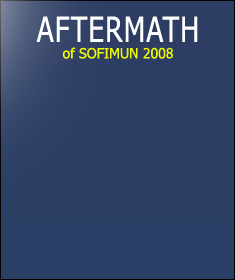 SOFIMUN is waiting for you! SOFIMUN is going to be held in between 20-27 July 2008 in the beautiful and old city of Sofia in the Balkan state of Bulgaria. You are invited to take part in the conference. Soon you will have the opportunity to find more information on this website. Don't hesitate to contact us at any time for any purpose or inquiry. 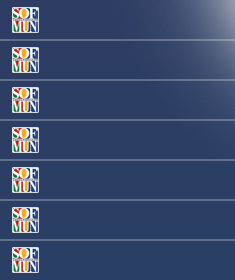 Communication between SOFIMUN's organizers, chairs, delegates, or even between newly MUN-addicted students is a goal of the SOFIMUN founders. That's why we have put up an online forum with discussion boards and other stuff. Get in touch, keep in touch, be together today for tomorrow. It is our honor, privilege and pleasure to invite you to take part in the first edition of Sofia International Model United Nations (SOFIMUN) event that will take place in the city of Sofia, capital of the Republic of Bulgaria. In the period 20-27 July 2008 over 150 people are going to debate some of the most significant problems that are of great concern to the international community today. Sofia International Model United Nations in its first edition is going to simulate 5 organs of the Organization of the United Nations - Security council, Human rights council, Economic and social council, Conference on disarmament and United Nations Environment Programme. If you have the idea to change the world, SOFIMUN is the right place for you. Sofia city is going to host the intensive and nervous talks on issues concerning world politics in areas of security, economics, politics, military, ecology and human rights. The conference aim at building bridges between nations and perspective people in a dynamic way by influencing them to cooperate and work together upon issues that might be the part of the world challenges tomorrow. Delegates will simulate at its best the procedures and rules of the world organization and gain knowledge on important problems and questions that are on the international agenda. The event will help delegates, participating in it to build a more self-confidence society, capable to handle and promote causes and ideas that can unite people in the mere future. Gaining knowledge of the ways that UN reacts and resolves problems is of great value to forming a climate of trust and values worth fighting for in every group in which every person will be during his life. Many words have been spoken, but the main thing hasn't been put forward yet... - WELCOME to the 1-st edition of Sofia International Model United Nations (20-27 July 2008).